From the New York Times bestselling author of The Dogs of Babel, a taut, emotionally wrenching story of how a seemingly “normal” family could become desperate enough to leave everything behind and move to a “family camp” in New Hampshire–a life-changing experience that alters them forever. How far will a mother go to save her family? The Hammond family is living in DC, where everything seems to be going just fine, until it becomes clear that the oldest daughter, Tilly, is developing abnormally–a mix of off-the-charts genius and social incompetence. Once Tilly–whose condition is deemed undiagnosable–is kicked out of the last school in the area, her mother Alexandra is out of ideas. The family turns to Camp Harmony and the wisdom of child behavior guru Scott Bean for a solution. But what they discover in the woods of New Hampshire will push them to the very limit. Told from the alternating perspectives of both Alexandra and her younger daughter Iris (the book’s Nick Carraway), this is a unputdownable story about the strength of love, the bonds of family, and how you survive the unthinkable. 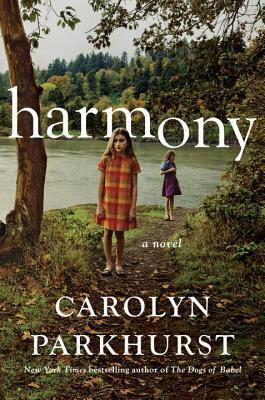 You don’t have to be a parent to moved by this gripping story of a loving family trying to do its best for its unusual child — but I think any parent who reads Harmony will be both nodding in recognition and cringing at the pain suffered by the well-meaning parents and their two children. Alexandra and Josh Hammond are happily married and the parents of two beautiful daughters. But as we first meet the family, daughters Tilly, age 13, and Iris, age 11, are in the back seat of the car as the family makes its way to New Hampshire, having given up their old lives in a last grasp towards normalcy at Camp Harmony. Camp Harmony is the brainchild of Scott Bean, a charismatic family counselor who seems to have all the answers. And Alexandra is desperate. Tilly is incredibly smart, but she’s wild and impulsive, full of tics and odd habits and obsessions, and lately has become a danger to herself. Even the last resort, super expensive private school for special needs children has finally said that they can no longer care for Tilly appropriately. When Scott Bean’s “Harmonious Parenting” crosses Alexandra’s radar, she becomes more and more convinced that Scott holds all the answers for her family. Ultimately, the family sells everything to invest, along with two other families, in Camp Harmony. The camp will provide a back-to-nature, holistic living experience, where the core families create a nurturing environment for all their children, then host paying families who come on week-long retreats in order to soak up the positive experience and bring it home with them. Scott Bean is clearly slick and polished, but he’s full of charm when he wants to be and it’s easy to understand how a family with no other options might see him as a light in the darkness. And at first, he seems to have a magic touch with the kids, despite the families’ hesitations over some of the camp rules, such as no electronics, no individual storing of car keys, no alcohol, and all sorts of work assignments and consequences for behavioral infractions. We see the family’s journey both through Iris’s eyes, as she narrates events starting from the Hammonds’ arrival at camp, and through Alexandra’s, as she describes the bumpy history of her and Josh’s child-rearing and Tilly’s escalating veering off the rails. It’s heartbreaking, truly, to see these good and decent parents doing the best they can, and still having no answers and feeling like they’re losing the ability to even keep their child safe, much less nurtured and encouraged. Either way, though, it was an intriguing period of history; the quaint euphemisms (“special needs,” for example, and “on the spectrum”), the fearmongering and misinformation, the chaos caused by the lack of an agreed-upon medical and therapeutic protocol. The elders lingered on the era’s rudimentary understanding of neuroscience, the dissent within the medical community itself as to nomenclature, classification, and diagnostic criteria. Celebrities giving advice based on superstition, rather than medical fact. The worry that a child’s natural inclinations and tendencies might become more destructive if left untreated. Parents seemed to be afraid of their own children’s brains. Wow. That last sentence hurts my heart. Author Carolyn Parkhurst has a way with words that is powerful and descriptive. She makes the reader care about these people. For the story to work, we have to sympathize; we have to understand how a normal, sane set of parents could end up sucked into a situation that revolves around a charismatic leader with increasingly bizarre rules and tests for loyalty. Sounds cultish? Yup, it does. But the wonder of Harmony is that we can see it happen, and even as we tell ourselves that they should have seen it coming and we would never allow ourselves to get sucked in like that… well, how do we know? For people at the end of their rope, desperate measures may not seem so crazy after all. Importantly, for this story to really work, I think it’s important that we care about Iris and Tilly as individuals, and the book gives them powerful, wonderful voices. The girls are clearly bright and full of passion. Tilly is amazing. Yes, she would drive you crazy if she was your big sister, and I can’t imagine having to deal with some of her more extreme behavior, such as her non-stop sexual comments or her unpredictable meltdowns. But at the same time, she’s powered by an inner curiosity and light, and we’re left hoping that her life may improve, that she’ll find a way to transition from her difficult adolescence into someone who can function in a demanding world. You’re still safe; it’s fifteen years since you stood where that girl in the white dress is standing. Here’s what you have in common with the couples still moving around you: you know, all of you, what these newlyweds are in for, these starry-eyed fledglings who think this is the moment where everything good begins. You’re dancing alongside veterans of wars and miscarriages and a thousand day-today disappointments. You cling to your husband, happy in his arms until it’s time to move to the side, to make way for couples who have lived through even more. Harmony is an unusual, lovely, disturbing, emotionally wrenching book about families and love. Check it out.